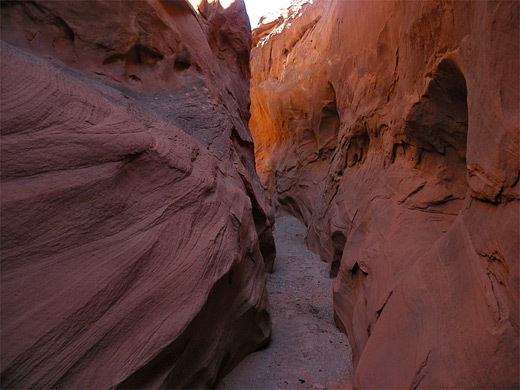 Although only ten miles long, Trachyte Creek has around 20 significant tributary canyons, all quite deeply incised into a big area of exposed Navajo sandstone extending south from Trachyte Point. The main gorge is mostly quite wide, containing a permanent stream flowing past sandbanks bearing trees and bushes, but its upper part has a few quite pretty sections where the waters form cascades, waterfalls and curving channels, as the canyon becomes temporarily vertical walled and moderately narrow. A parallel tributary - the north fork - is rather more confined and has several proper slot sections, which while never very deep, are colorful and easy to explore. A round trip down the dry slot and back up the watery main fork makes a pleasant half day hike, encountering a good variety of rock forms and desert scenery. TopoQuest topographic map of upper Trachyte Creek. 24 views of upper Trachyte Creek, and a video (12.2 mb). 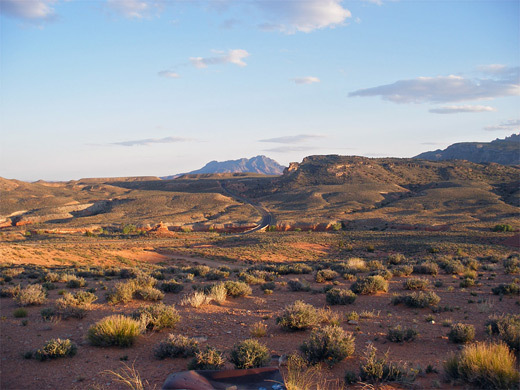 Either side of the highway, the north fork of Trachyte Creek is a dry, sandy wash. Walking downstream, the drainage rounds a few small bends then drops 40 feet over a dryfall, an obstruction easily passed on the right. A semi-permanent pool lies beneath, surrounded by cool, mossy walls. Beyond this the streambed stays relatively wide for a while before entering the first of three colorful, narrow passageways of increasing depth - each fairly short and never particularly enclosed, but pretty, bordered by smooth orange/red rock displaying thin strata and water-carved undulations. The last and deepest contains several logs wedged across the streamway, and a huge boulder in the middle, partly blocking the passage and causing further driftwood to accumulate. 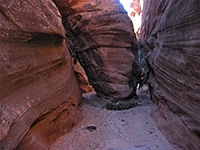 There are no obstacles in the narrows, and plenty of climb out routes. A tributary joins from the north; upstream are more shallow slots interrupted by chokestones, and drops of a few feet over dryfalls. 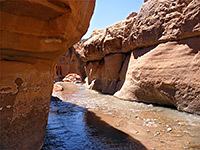 The surroundings change from small, soil-covered hills and low cliffs of crumbling strata, to rounded Navajo sandstone domes, as the dry streamway turns due south and widens to a bright, sandy-floored wash beneath reddish, vertical walls, and soon meets the main fork of Trachyte Creek with its year round flow. 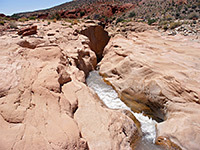 This canyon provides easy walking upstream beside the water, crossing the creek several times to avoid deeper sections on one side or the other. The water is mostly shallow but fast moving, flowing over a few minor falls and cascades between longer, more level stretches. Some places have deeper, narrower channels through patches of exposed rock. The walls are vertical in only a few places, where the canyon becomes quite confined; mostly they are gently sloping, the wash open and sunny. In one spot the waters flow swiftly along a shallow, curving channel then fall 20 feet into a narrow gorge with pools and boulders; quite a photogenic scene. Highway 276 approaches soon after the falls, and the return route is along a disused track, past some concrete foundations suggesting that a house once stood here. All this area seems little visited, though faint tire marks on the track and in the canyon indicate that ATVs sometimes drive right down the creek and up the north fork tributary to the end of the slot.